C. W. (Charles W.) Spaulding was the brother of Mary Adelaide (Spaulding) Ramsay, who was the grandmother of Elsie (Galloway) Hamilton. This PDF file has three documents from the Office of Records of Umatilla County, Oregon concerning Supplina Hamilton, County Commissioner 1863. Effie Hamilton was the daughter of Supplina and Sarah Jane "Jane" (Sumpter) Hamilton. Effie and Walter were married in Juliaetta, Idaho on July 3, 1895. Effie was the daughter of Supplina and Sarah Jane (Sumpter) Hamilton. She would later be married to James Darland. Walter and Effie on the farm in 1910. Effie is the daughter of Supplina and Sarah Jane (Sumpter) Hamilton. It's interesting to note three things about this record: 1) Walter's brother Frank is still living with them as in the 1900 Census and listed as a 'Farm Hand', 2) they live next to George W. Sumpter (age 50) and family. This is George Washington Sumpter the youngest child of Alexander and Nancy (Prather) Sumpter, the parents of Effie's Mom (Sarah Jane Sumpter). Effie's Uncle George was named after the original George Washington Sumpter who was carried as an infant by his mother to meet his father who was a soldier in George Washington's Continental Army, and serving under General Washington. The third and last point of interest is that Effie's sister Pirena and her husband Samuel S. Gilbert (Walter's brother) have left their homestead in Nez Perce, County Idaho. Samuel and Pirena are found in the 1910 census living on 4th st. in Albany Oregon and they have a grocery store. They moved close to their Gilbert extended family in Albany. Effie no longer has her sister close by in Idaho. Ward was the second oldest child of Judd and Annettie Hamilton. His full name was Supplina Ward Hamilton. He was known as Ward. Sometimes his name is written as Ward S. Hamilton or S. Ward Hamilton. This is a fairly large 4mb PDF file. I created it as a Word doc having reviewed the state birth index for 1907-1919. I looked at several counties that have known relatives in them in this era. Many of the names in this document are decendants of Supplina and Jane Hamilton or of Supplina's brother William M. Hamilton. The source document contained many duplicate entries. The PDF document is full text searchable. This PDF file has a few selected pages from the book, Washington-North Idaho Disciples. This book chronicles the history of the Disciples of Christ or Christian Church movement in Washington and North Idaho. S. Hamilton (Supplina Hamilton) is remembered on those pages associated with the church in Dixie and Waitsburg, Washington. He is also noted on the list of early Washington evangelists. This is the household of Lizzie Leonord (Lenord). She was a neighbor (a couple pages away in the Wallowa census records) of Greenberry and Hattie Templeton in 1900. This same Lizzie is listed as Greenberry's (now third) wife in the 1910 census and her youngest son James is listed as Greenberry's stepson. Later (in 1910) Lizzie's other son Cole (who is in her household in 1900) will be living nearby (a couple houses away from Greenberry and Lizzie) as an independent head of household. Wilbur Ross "Ross" Hamilton was the son of Judd Hamilton and Laura Annettie "Nettie" Templeton. Ross was born likely near the Hamilton homesteads on Union Flat Creek, Whitman County, WA, south of Endicott, WA. He was born on April 26, 1895. Wilber Ross 'Ross' Hamilton was the oldest child of Judd and Annettie (Templeton) Hamilton. Judd was the son of Supplina and Sarah Jane 'Jane' (Sumpter) Hamilton. Land patents document the transfer of land ownership from the federal government to individuals. 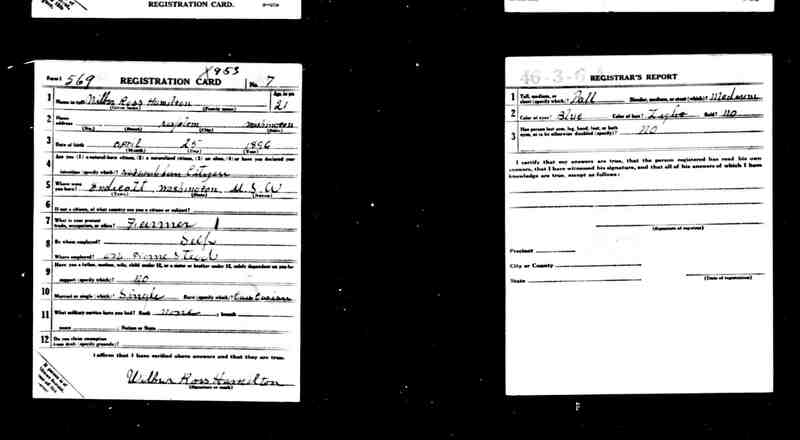 This scanned image from the Washington State Digital Archives is Wilbur Ross "Ross" Hamilton's WWI Military record on file with the State of Washington. Army Serial Number: 4.704,308. Inducted 8/29/1918 at Okanogan, Washington (residence, Nespelem, WA). Served in the 166th Depot Brigade (likely in Camp Lewis, Washington) until discharge on 1/25/1919. Rank: Private. Honorable Discharge. 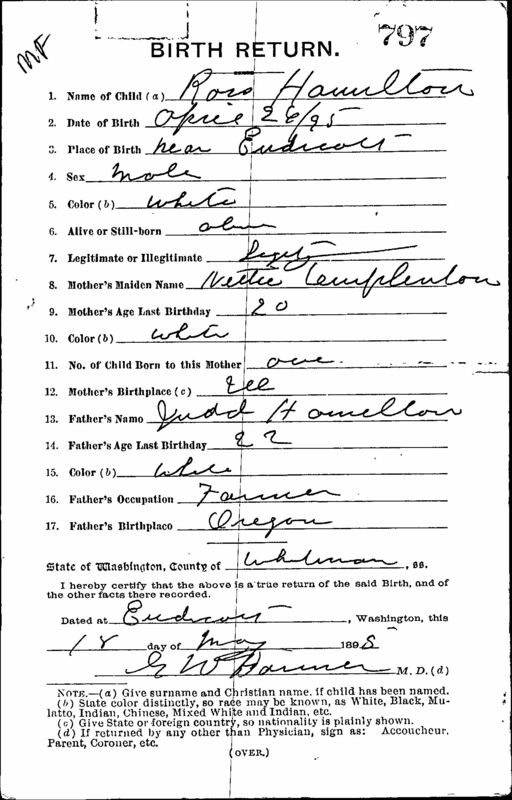 Wibur Ross Hamilton (son of Judd Hamilton and Laura Annettie Templeton) was awarded a patent on a 600 acre homestead in Okanogan County, WA, West of Nespelem, WA in 1927. By the time this map was published in 1934 his homestead was owned by Fred Hunt. 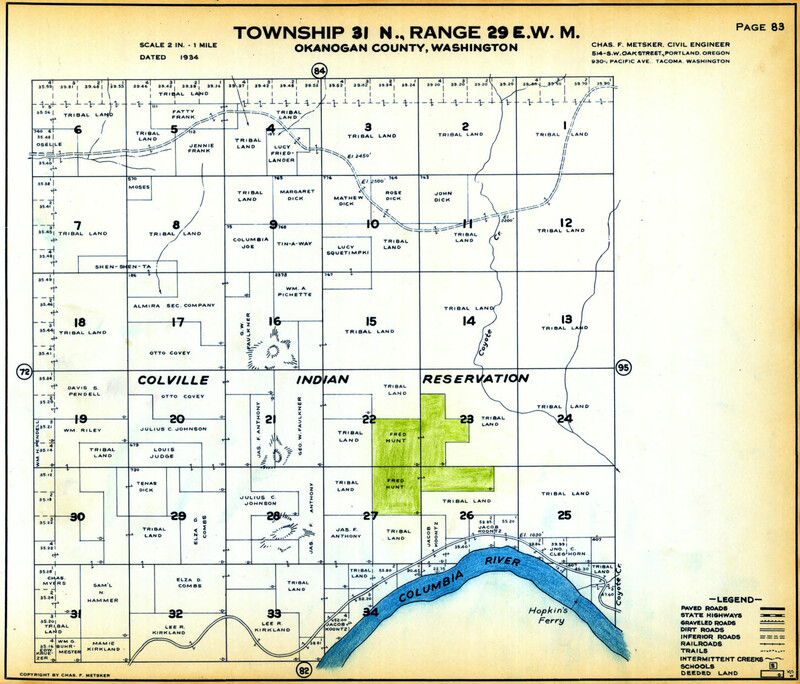 Great Uncle Ross' original homestead parcels are marked in green with Fred Hunt as the then current owner. Township 31 North Range 29 East Willamette Meridian. Ross is the first born of Judd and Annettie Hamilton. Judd was a son of Supplina and Sarah Jane 'Jane' Hamilton. Ross lists his birth date as April 26th, 1896 in Endicott, WA. He lists himself as a self-employed farmer on his homestead in Nespelem, WA. James M. Hamilton was born in Morgan County, Illinois on April 10, 1834 along with his twin brother, William McCord Hamilton. James was a bachelor farmer from Mason County Illinois when he enlisted in the 85th Illinois Infantry in 1862. He served as an officer in C Company as a 2nd and then 1st Lieutenant. James was captured by the Confederates on July 20, 1964 at the bloody battle of Peach Tree Creek, GA near Atlanta. James returned to Illinois after the war. He died on his farm near Mason City on the 20th of February 1869. He apparently had a lingering illness. His last will and testament is currently the most important document we have in the family for understanding the children of John & Altha (Judd) Hamilton. We believe that the will names all his siblings. Along with the living he mentions the heirs of the deceased or perhaps ones he had lost track of. I was first aware of the existence of James will from a copy that Joyce (Stover) Hamilton shared with me. This copy was of the notarized original. This link below is to the version as recorded in the Mason County, courthouse. Its quite a bit more readable. William Foley, Jr. was the son of William H. Foley and Martha Ann "Annie" Ramsay. He died tragically in a train and wagon accident. This account was published in the Waterville Press, of Waterville, WA in 1901. William would have been around 4 years old. William J. Hamilton and Pearl C. Hamilton were children of Duron and Laura (Bruton) Hamilton. Duron was the first born of Supplina and Sarah Jane (Sumpter) Hamilton. 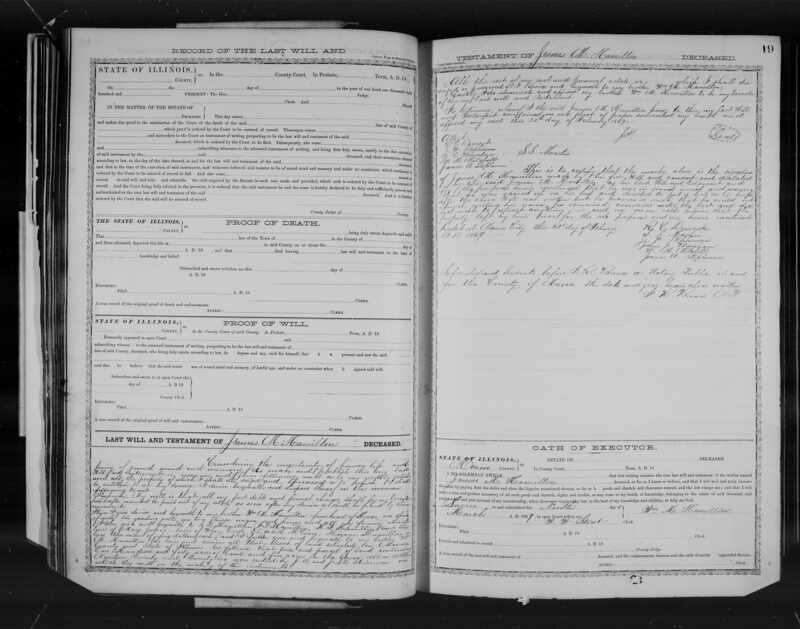 William McCord Hamilton, just married in his 40's to Rosa (Rosy) L Porter (in her 20's) listed in Edna Township, Cass County, Iowa in the 1880 US Census. William and Rosa were married on April 20, 1879 and they had a 3 month old infant daughter, Mary, at the time of the census (June 10, 1880). They were living in the household (the farm) of Rosa's widowed father, Edward Porter. 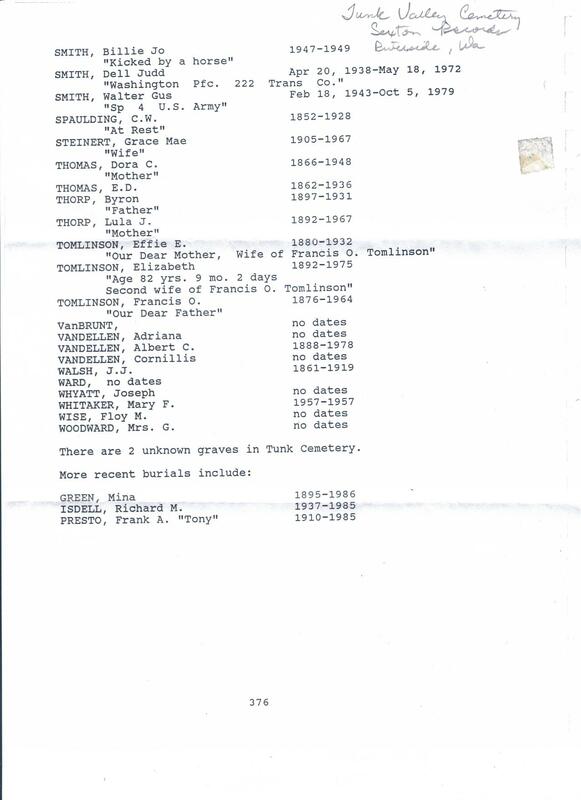 It's important to note that the enumerator lists both of Williams's parents as having been born in Massachusetts. William McCord Hamilton was the son of John and Altha Hamilton. He had a twin brother James M Hamilton who enlisted in the 85th Illinois Infantry with him in 1862. William was medically discharged from the Union Army in Nashville, TN on Jan. 27, 1863. This reason the army doctor gave for his discharge was this: "Chronic Diarrhea and incipient Phthisis [Tuberculosis] caused by exposure in the field too soon after having Rubeola [Measles]" William was described a 6 feet tall, dark complexion, grey eyes and black hair. William McCord Hamilton Civil War Service Record. William was the twin brother of James M Hamilton and the son of John and Altha (Judd) Hamilton. William was born in 1834. 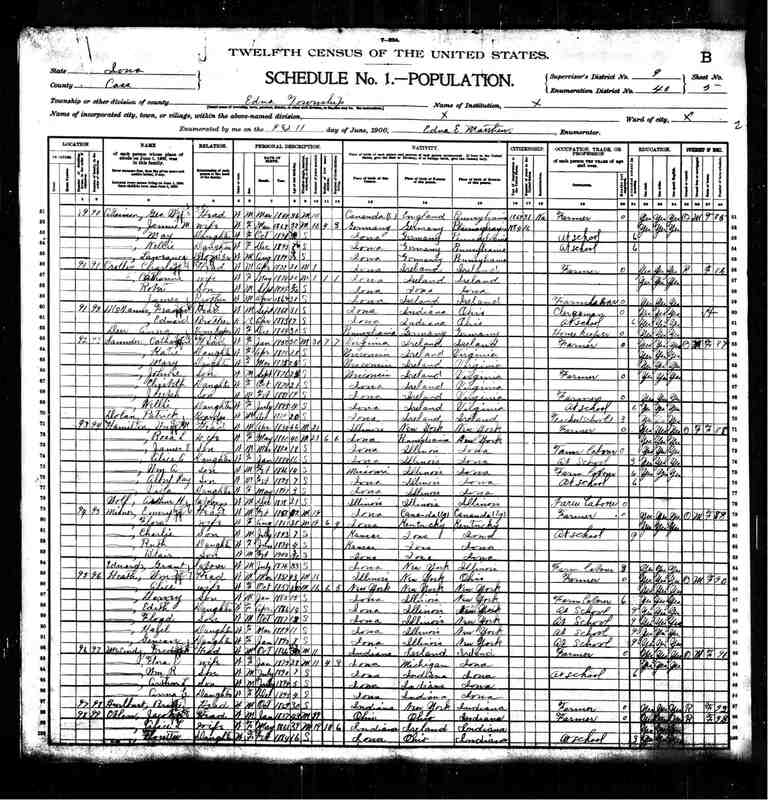 This 1900 US Census records the William McCord Hamilton family (wife Rosa L Porter) in Edna Township in Cass County, Iowa. Willam was the twin brother of James Hamilton and the younger brother of Supplina Hamilton, all born in Illinois. It's noteworthy that in this census the enumerator recorded William's parents as having been both born in New York. In the census the same year in Washington State, William's older (two years) brother Supplina had recorded that their father was born in Connecticut and their mother in Massachusetts. The boys were all orphaned young in Illinois, their parents having emigrated from New York state (where they were married) to Illinois. 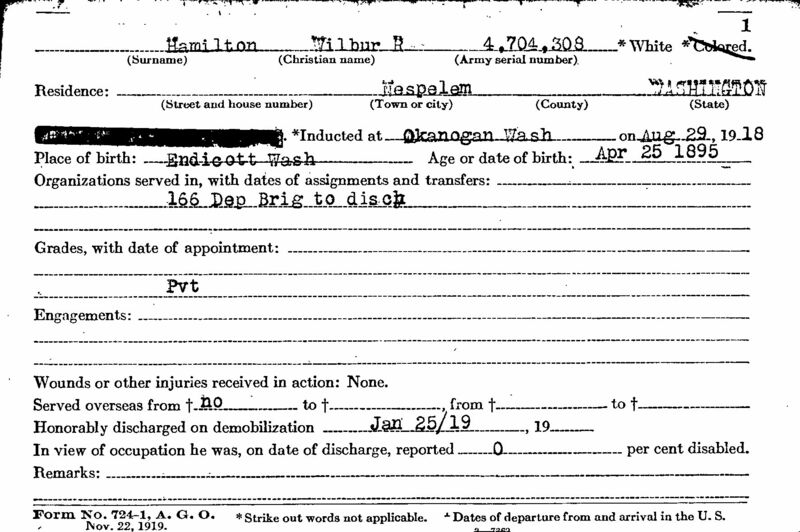 This is a scan of the index of William McCord Hamilton's civil war pension records. It records William as having been in Company C 85th Illinois Infantry. William was wounded and discharged. He held the rank of 1st Sergeant. It appears to record that he filed for pension benefits for a disability ('invalid' classification) in 1880. William was married in April of 1879. The index also records the claim number of his widow, Rosa L. Hamilton for survivor benefits on August 10, 1903. William was a younger brother of Supplina Hamilton. William had a twin brother, James who also served in Company C.
Lillian "Lillie" Galloway was the daughter of James W. and Mary A. Ramsay. She had been married to Charles A. Galloway in 1903. To that marriage was born Elsie and Effie. That marriage ended in divorce and then to remarriage to William Fee in 1907. The Fee's lived in Grand Prarie, Alberta Canada for many years. Lillie lived a long life and had other children with William Fee. She died in Grand Forks, British Columbia.